Great news from European Dog Show! I am over the moon after news from Brno, Czech Republic. There were hold European Dog Show 2014. Judge - breed specialist Elisapeth Feuz, Switzerland. Our young female Raven's Tot Keen Sensation (Sandra) was shown in Junior Class and was 3rd Excellent from 15 dogs in a class. Our dear Britney - Raven's Tot Just Dance was shown in Champion class by her co-owner Marina Grigorieva. 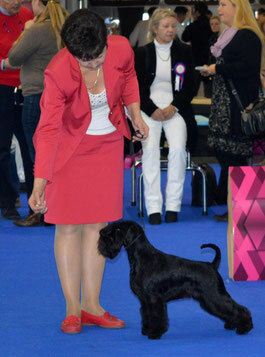 She won her class and became Best Female, getting CAC, CACIB and of course the most desired title - European Winner 2014!!! Thank you my dear friends for congratulations! Our gratitude to the judge Elisabeth Feuz for appreciation of our Britney!